Has Chile Joined the First World? Watching the rescue of the 33 workers at the San José Mine in Chile, I was amazed at how well organized it was. I probably shouldn’t have been after reading about the earthquake in Chile earlier this year and how few deaths (relative to the quake’s magnitude) resulted because Chile long ago instituted building codes to make structures more earthquake resistant. But the mine rescue was truly spectacular–it wasn’t just good, it was something unique in history. In light of these two emergencies that became examples of good management instead of tragedies, I’ve been wondering if Chile is close to becoming a First World country. Chile has been looked upon as a member of the Third World; yet while many other South American countries have made noise recently, Chile has been quietly getting on with development. Between 1987 and 2005 the percentage of people living in poverty fell from 46% to 18%. The non-tragedy of February’s earthquake illustrates how Chile learned from its history and instituted technological and legislative measures to safeguard its infrastructure. Indeed, Chile’s economy rebounded almost immediately after the quake. At the individual level we all care about the lives and safety of those we know. But at an institutional level, underdeveloped nations sometimes exhibit shocking disregard for the welfare of their citizens. The world has seen this in its extreme form in cases of genocide; it also happens to a lesser degree when natural disasters kill thousands of people who remain nameless and uncounted in the eyes of their own governments. I noticed this when researching the recovery efforts after the 2004 Indian Ocean tsunami: Indonesia, a rapidly developing nation, suffered the worst loss of life because it was nearest to the epicenter of the undersea quake that caused the tsunami, yet it had one of the most accurate counts of lives lost because it cared about how many of its citizens were killed. During the mine rescue, Chile mounted a long and expensive effort to save the lives of 33 men–a small number, when you consider the death tolls of other disasters around the world. (In China 2,631 coal miners died in 2009, approximately 50 deaths per week.) Citizens of Chile and much of the world followed the rescue efforts with rapt attention. Names, photographs and biographical information of each man were made available to the media. These were men, individuals, human beings with families and friends and lives worth saving. They were not the unnamed masses of Third World disasters. This is human rights face to face. The rescue effort would not have been possible without technology. It began before the accident that cause the mine collapse, when a safety chamber was constructed within the mine in case of need. Had there not been a protected place for the 33 miners to wait to be found, there could never have been a rescue. It took 17 days for workers above ground to determine that there were survivors (and I cannot imagine what it was like below ground during that time). Drilling began almost immediately–more than one drilling effort, in case difficulties were encountered, and as it turned out it was the “Plan B” shaft that proved successful. What hasn’t been mentioned as often is that some of that technology came from outside Chile. No matter. Where there is respect for the lives of individuals there’s no room for “not invented here” syndrome. Companies in the United States, Canada and South Africa provided equipment, personnel and expertise. NASA provided technical and medical advice based on experience with long-duration space flight and emergency management. Using technology wisely means incorporating the best available. All the technology in the world won’t help without coordination, and in a rescue effort of this scale the national government needs to assist as much as it can and stand aside when others are capable of doing the job. From what I’ve read, the Chilean government and President Sebastián Piñera did an admirable job of coordinating technology, medical and all other aspects of the rescue. The agencies and individuals assigned each part of the job did their work perfectly and without interference, right down to the day of the rescue and the triage process as miners returned to ground level for the first time in 70 days. The media descended on the mine, especially after it was learned that 33 miners were still alive below ground. Nobody tried to stop them or shut them up. Family members arrived and built a camp to watch and wait. Nobody stopped them, and support services were provided to them as they waited. Outside companies were called in to help and, so far as I can tell from news accounts, were given free rein in studying the situation and proposing solutions. When the United States began manned space flight, the Soviet Union was ahead. But NASA did something the Soviets would never dream of–they launched their rockets on live television in front of a global audience. It’s brave, and maybe a little crazy, to allow that kind of access to a risky endeavor. But it reveals confidence, honesty, and a willingness to admit failure along with celebrating victory. Mature nations can do it. As I watched the live video of the miners being pulled out of the ground in the Fenix rescue pod, I saw family members and bystanders with cameras, in addition to hundreds of television and media crews in the background. President Piñera gave a speech and even tweeted that day. If you’ve done the best possible job you could, there’s nothing to hide. So is Chile a First World nation? Not quite. Are they close? It certainly looks that way. 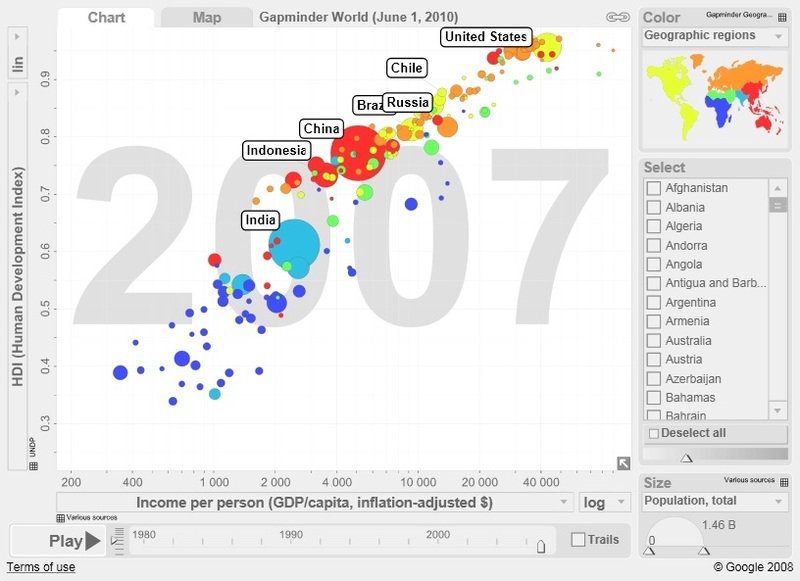 A comparison of Chile to the “BRICI” nations (Brazil, Russia, India, China, and Indonesia) and the United States shows that Chile’s per capita GDP and Human Development Index compare favorably. (The chart above was created with the wonderful Gapminder Desktop software, a truly fun way to explore world demographics.) They have certainly achieved a great deal economically and socially. Yet Chile is a small nation of only 16.6 million people. In per capita GDP, life expectancy and Human Development Index, Chile compares favorably with the G20 nations; yet it has a significantly smaller population. As noted above, almost half the population lived in poverty in 1987. Per capita GDP has risen to $14,700 in 2009 ($13,125 in 2007, the most recent information available for the table above) and the percentage of people living in poverty has declined. But Chile still has far to go to catch up with the United States and western Europe. Is this the push they need? It will take years of stable government and economic growth to really be a “First World” nation–but now they have most of the world cheering them on.